Wishing everyone a Happy Winter Solstice Festival! 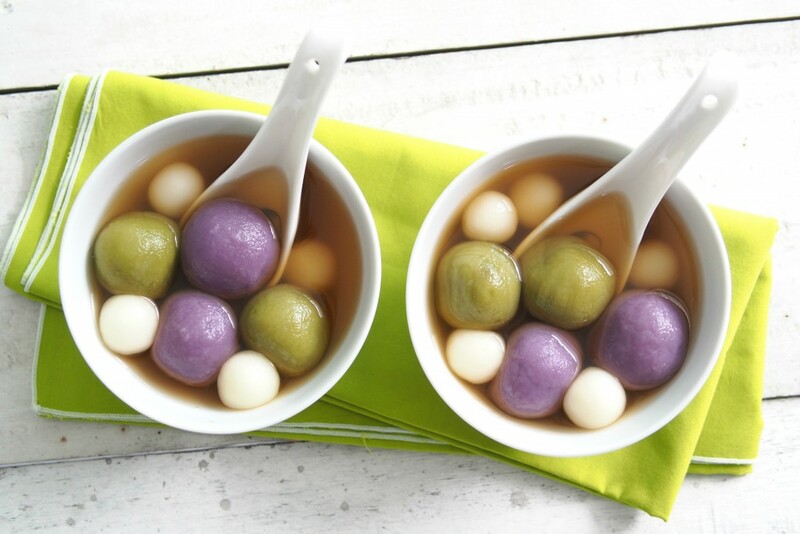 My late mother used to prepare the “Tang Yuan” on the night before to be cooked and served fresh on the morning of “Tong Zhi”. As is the tradition, she would always tell us that we would be one year older after eating the “Tang Yuan”. Boil the water in a pot then add Ginger and Pandan leave. Bring it to boil over medium heat and until you can smell the aroma of pandan leave and ginger. Grind the toasted black sesame in food processor or hand blender until fine. In a bowl, mix the blended black sesame, sugar and olive oil together and mix well. Keep aside in refrigerator. Clean and peel the sweet potato. Steam it till soft, about 15 to 20 minutes. Mash the cooked potatoes with a potato riser. In a mixing bowl, mix the glutinous rice flour and mashed potato. Slowly add water, one tablespoon at a time. Mix and knead until become a soft dough. Shape dough into 18 small balls (18g each). To shape the dumpling: (A) Flatten the sweet potato ball lightly. (B) Make a small well in the centre of the dough and fill with ½ teaspoons of black sesame. (C) Pinch the dough together to close, roll them in your palm to form a smooth ball and lay the balls on a plate sprinkled with flour (this will prevent glutinous balls stick on the plate). (D) Repeat this step with the remaining dough and fillings. Drop the balls into the boiling water and cook until they floats to the top, about 3 minutes. Then scoop them out and drop into the bowl of ice water for a 2 to 3 minutes (this will keep them springy). Then take the balls out and drain. To serve, place a few dumplings in a small bowl and pour some syrup over. Serve hot. In a mixing bowl, Slowly add water, one tablespoon at a time into glutinous rice floor. Mix and knead until become a soft dough. Pinch the dough into small balls (5g each) and roll them in between your two palms into round balls. You should have at least 30 balls. 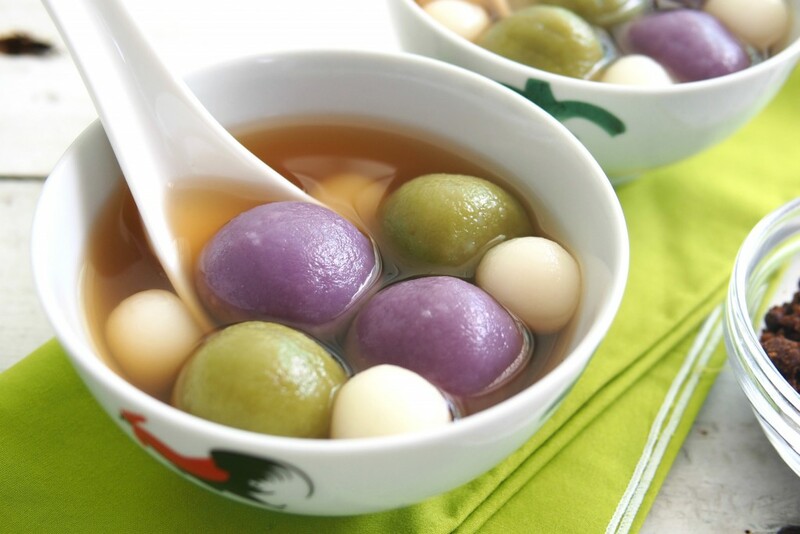 In a large bowl, combine glutinous rice flour, pandan juice and water, kneading well to form a smooth dough. Hi, the rice balls look beautiful. May I know what is the method used to extract out the pandan juice? Also, how many rice balls does each of the above recipe yield? Thank you! Sorry, I can't really remember how many. I cooked this last year.